The Huawei Ascend W2 isn't exactly much of a secret after the wealth of leaks and speculation surrounding the handset and we now have our clearest sighting yet. Apparently the Ascend W2 was found chilling out at Mobile Asia Expo 2012, complete with a full spec sheet and a third colour option, red, to go along with the previously leaked yellow and blue. 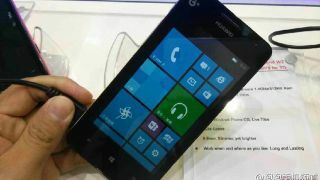 The details which accompanied the Ascend W2 at the show revealed that it's running a 1.4GHz dual-core processor and 512MB of RAM which is responsible for churning through Windows Phone 8 on the 4.3-inch WVGA display. There's also apparently 8GB of storage inside the handset which measures a reasonable 134 x 66.7 x 9.9 mm, and Huawei reckons its got a long lasting battery too. According to the paraphernalia which was snapped at the Expo, the Ascend W2 is being touted as "the first low-cost smartphone with Windows Phone 8 for TD". However the Nokia Lumia 520 and less-powerful Ascend W1 are both cheap WP8 devices, but the "for TD" part may refer to a specific frequency used in China which the other two handset may not currently support. The Chinese firm is yet to officially announce the handset, but it's probably only a matter of time before we see the Huawei Ascend W2 confirmed.